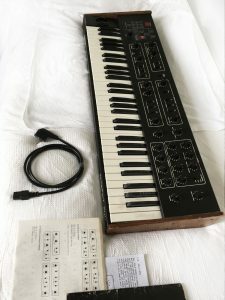 “Fully working Original Sequential Circuits Prophet 600 Keyboard Synthesizer. Some marks on a few upper keys as well as on one of the lower ones as shown on the pics. The wooden parts show some marks of age and scratches but its only cosmetical (you can actually get the fitting wood parts to replace them, if you wanted).